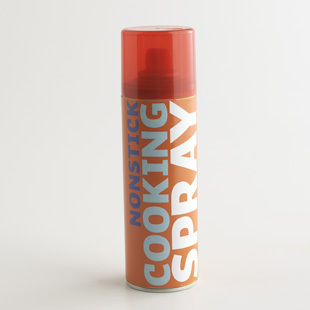 Cooking spray: should you use it? In the EatingWell Test Kitchen, we use cooking spray because it’s a fast, no-mess way to make a tiny bit of oil go a long way so we can keep calories in check. Calorie for calorie, cooking spray is similar to other oils: spraying for 1 second (enough to coat a large skillet) is about 9 calories; 1/4 teaspoon canola oil is 10 calories and would be just enough to very thinly coat a skillet. In addition to using cooking spray to quickly coat a pan with a little oil, we also use it to coat breaded foods like chicken and fish for “oven-frying.” The oiled breading gives a deep-fried crunch with a fraction of the ­calories and fat compared to deep-frying. Cooking sprays do contain propellants to push the oil out of the can, but the propellants are on the U.S. Food and Drug Administration’s “Generally Recognized As Safe” (GRAS) list and considered safe to consume. Although the propellants are hydrocarbons, they’re “not generally thought of as a major contributor to global warming,” according to David D. Doniger, policy director of the Natural Resources Defense Council’s (NRDC) Climate and Clean Air Program. Still, if you want an alternative, you can use a manual pump oil spray bottle. Aerosol cans are recyclable as long as they are empty and puncture-free. Check with your local waste service for specifics.